Today is my first day in sunny Florida, after a 3-day road trip driving my mom down to her winter home from Toronto. 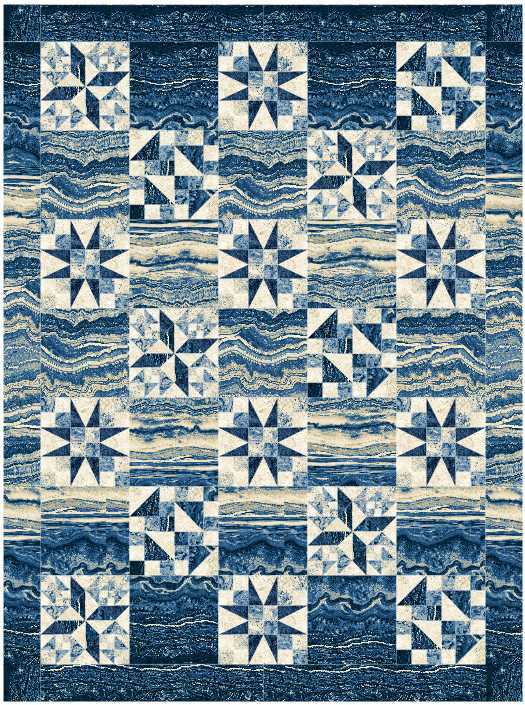 It is also my day to post as part of the Quiltmaker’s 100 Blocks Volume 10 Blog Tour. How fabulous to be sitting outside in balmy weather to write this! This issue of “100 Blocks” means that 1000 unique blocks have been custom designed for Quiltmakers’ readers – quite an accomplishment, I think. I have participated in several of the blog tours and it has been great fun playing with many of these designs. For this issue I again jumped at the chance to play. 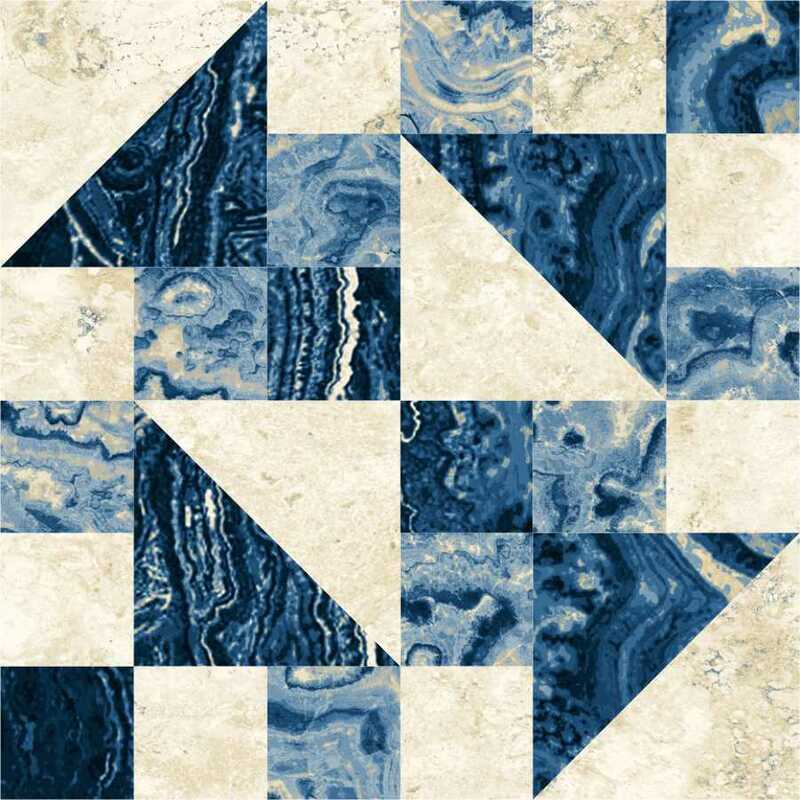 I scanned the issue for blocks by designers who design patterns in partnership with Northcott, and found 4 – #961 by Karen Bialik, #976 by Chris Hoover, #989 by Celine Perkins & #998 by Shayla Wolf. I recreated the 4 blocks above in Electric Quilt. Then I downloaded the fabric collection that is featured in Northcott’s advertisement in this issue (Stonehenge Earth Rhythms). It is so easy to download fabric collections into EQ7 from Northcott’s website – simply click on the “Download Fabrics for EQ” button. I know that the quilt that I create in EQ7 will look identical to the real thing, without cutting into any fabric. I can switch fabrics until I am happy with the final result, then start cutting. Karen’s block was actually easiest for me to design as a quilt. It is so pretty in the Artisan Spirit Shimmer fabrics that Karen chose for her block. Here’s my version using Earth Rhythms. 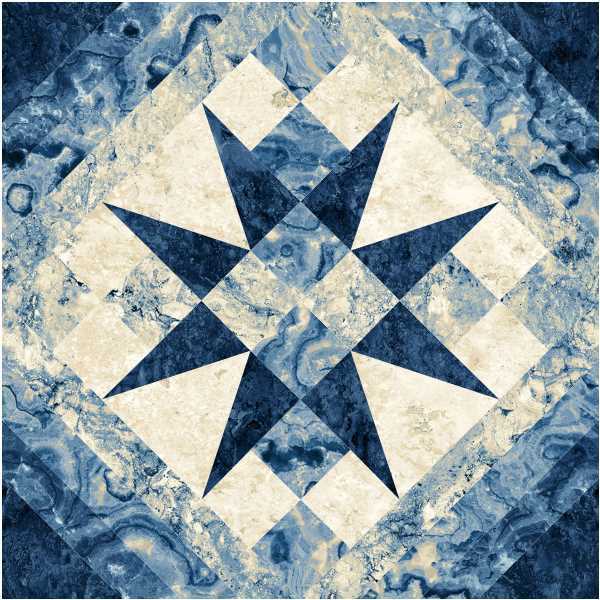 Karen sent me a sneak peek of a quilt that she has designed that uses her block, and it is stunning. I think it will be featured in the next issue of “Quilts From 100 Blocks”. 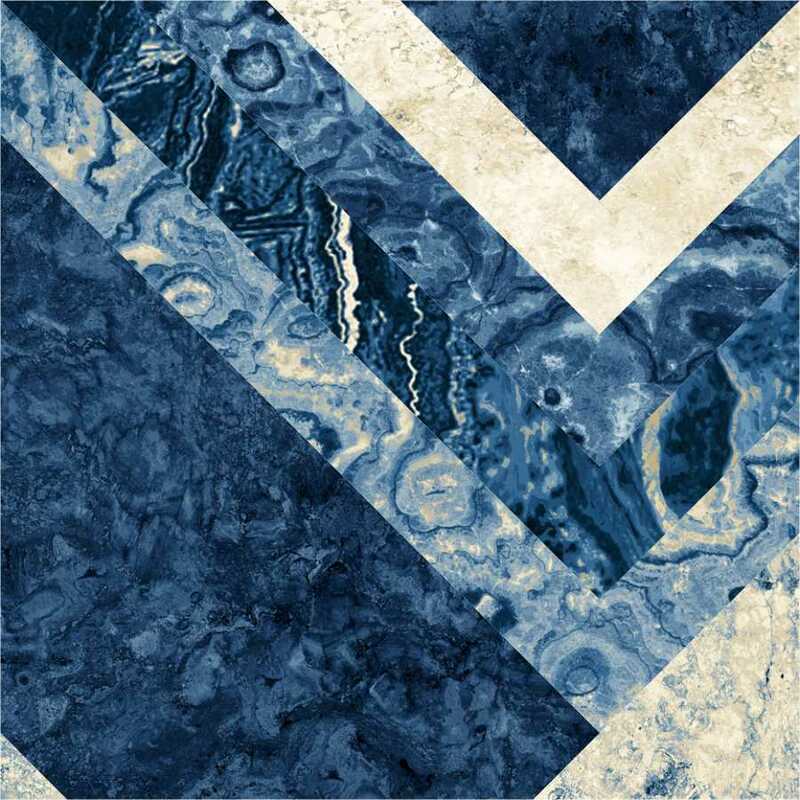 Karen is a prolific designer, and her designs for Northcott continually impress me! Not only does she design patterns, she also runs a terrific quilts shop, The Fabric Addict, in Lethbridge, AB. Chris Hoover is also a talented prolific designer, and she also used Artisan Spirit Shimmer for her block. 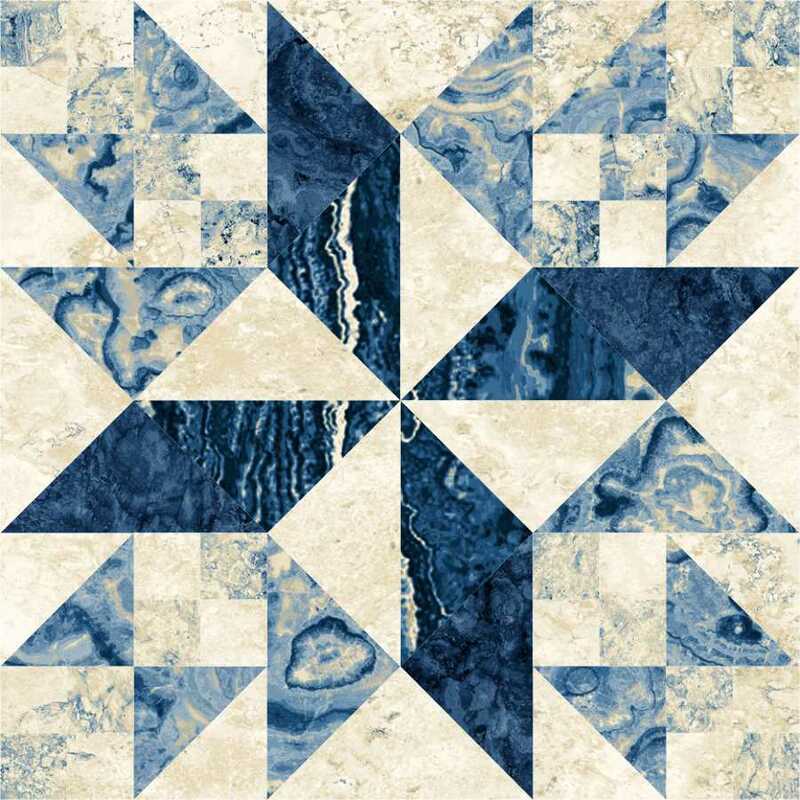 Chris designed Northcott’s 2013 Block of the Month program with the Shimmer collection. Here is Chris’ block in Earth Rhythms. Celine Perkins has had a block included in “100 Blocks” for as long as I can remember, and I enjoy playing with her blocks. Here is my Earth Rhythms version. Shayla Wolf and her mom Kristi are Sassafras Lane, a fairly new pattern company. Shayla is young, and her designs tend to be modern, so I was not surprised to see that her block for “100 Blocks” was modern. Here is my version with Earth Rhythms. Of course I had to play with the blocks in some different layouts. And of course I always give away fabrics, and the folks at Quiltmaker are giving me a copy of “100 Blocks Volume 10” to give away as well. So…. 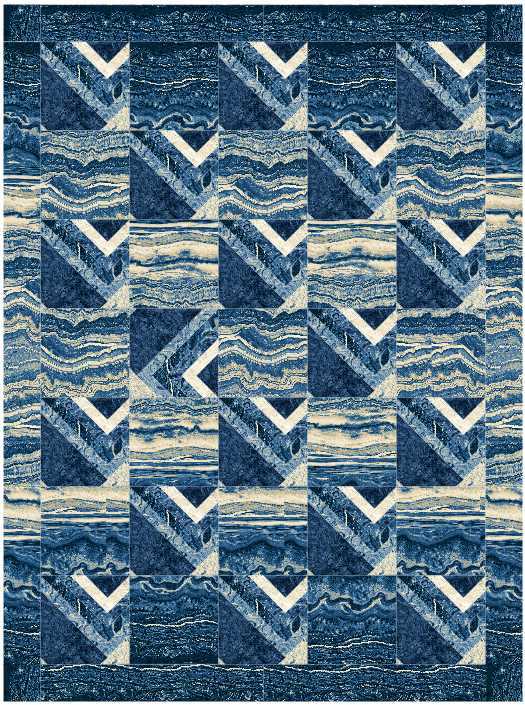 for a chance to win the magazine and some Stonehenge Earth Rhythms fabric, please post a comment on my blog by noon tomorrow, telling me your favorite BLOCK and QUILT in this post. Please visit the other blogs in the tour as well, and happy Quiltmaking!